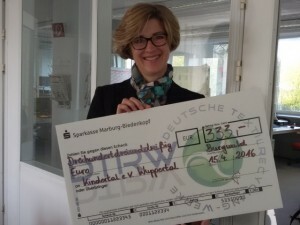 The organisation Kindertal (Child-valley) from Wuppertal is happy about a donation of 333 Euros from DTRW GmbH. Vivica Mittelsten Scheid, patron of the organization has received the check beaming. Kindertal supports children and adolescents in financial distresses. Many children in Wuppertal live in difficult social conditions. They grow up in cramped flats, see sickness, unemployment and depression at home and therefore they have to learn to disclaim a lot of things. A relaxation from the wearing situation is positive for the children, their school career and their families. Kindertal supports children which are in need for such an relaxation and subsidise for example pedagogical vacation trips. Also the association helps needy children with clothes and child-furniture.